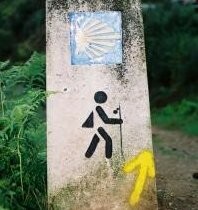 A Guided walk from the north of Portugal to Santiago de Compostela. The Portuguese Way to Santiago is a humble, beautiful road running between cruceiros (monumental crosses) and the tolling of church bells around rural north Portugal and Galicia. Travellers should not expect the great mountains and the scorched plateaus of the well-known Via Frances (French Way) across northern Spain that is more epic while the Portuguese Way is considered to be the ‘inspired’ route. Neither El Cid or Charlemagne will appear along the trail but in the depths of the hedgerows or behind some oak or sitting at the foot of an ancient cross you can sense the presence of former minstrels who walked this way. Minstrels such as Martin Codax, Mendino and Bernal de Bonaval who exchanged songs with friends as the sun turned to gold on the carved stone. This tour takes you along the very best stretches of the route and we plan to experience ‘pilgrimesque politics’ as described in considerable detail by Nicola Albani in the 18th century living as well as possible and enjoying everything the route has to offer. Pilgrims are entitled to the Compostela upon arrival in Santiago. £900 per person. Single supplement £135. Transport and transfers throughout by minibus, 8 nights accommodation in a twin/double in a mixture of old country houses, inns and modest hotels. 8 breakfasts, 7 dinners. Experienced guide, transfer of luggage. Flights to and from Portugal/Spain, meals not mentioned above, drinks and travel insurance. Day 1 – Transfer from Porto to Tui for overnight. Day 2 – Collect Credencials from Cathedral and then walk to Porrino via country roads and woodland paths. 16 kms/11 miles. Overnight Porrino. Day 3 – A gentle climb up and over Monte Cornedo and so through Redondela, then little hamlets to the coast. 22 kms/13.75 miles. Overnight Arcade. Day 4 – A shorter day through quiet countryside to the ancient town of Pontevedra, with its beautiful old town. 12.5 kms/7.8 miles. Overnight Pontevedra. Day 5 – Woodland and gentle river valleys to finally arrive at the old spa town of Caldas de Reis. 23.8 kms/14.9 miles.Overnight Caldas. Day 6 – Walk along river valleys and through ancient woodland to Pardon. 19.2 kms/12 miles. Overnight Padron. Day 7 -The longest day, but a true pilgrim experience, as we walk through the villages of Galicia to our final destination, Santiago de Compostela, for overnight. 25.6 kms/16 miles. Overnight Santiago. Day 8 – Day free in Santiago, with the chance to attend the midday Pilgrim mass in the cathedral, with, if you are lucky, the giant censor swinging around the interior. Overnight Santiago. Day 9 – Departure after breakfast.